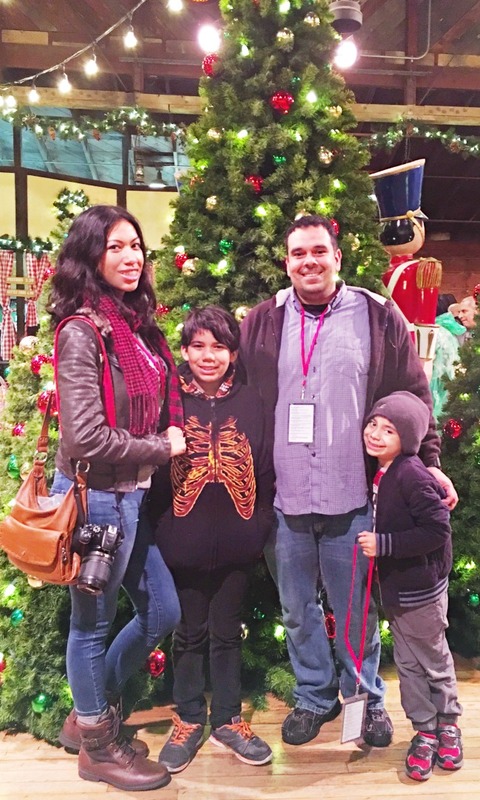 We spent a chilly day at Knott’s Merry Farm celebrating the season, as their guests. We had a fabulous time (as always) but I found myself constantly trying to find shelter from the cold. 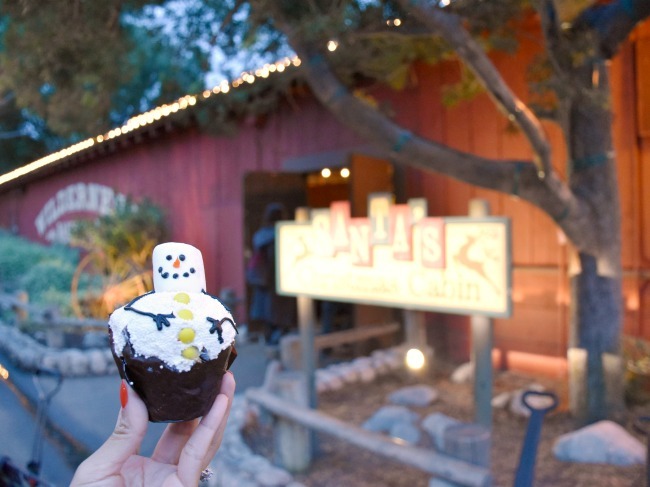 The sad thing is, it’s not like it’s zero degrees at Knott’s Berry Farm. 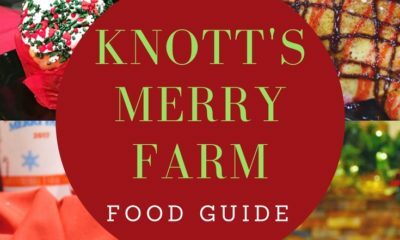 But I do tend to get cold VERY easily (I’m talking about basically being unable to function if it’s under 70 degrees) so I wanted to share with you this short guide on how to stay warm while you’re visiting Knott’s Merry Farm in Buena Park, California. 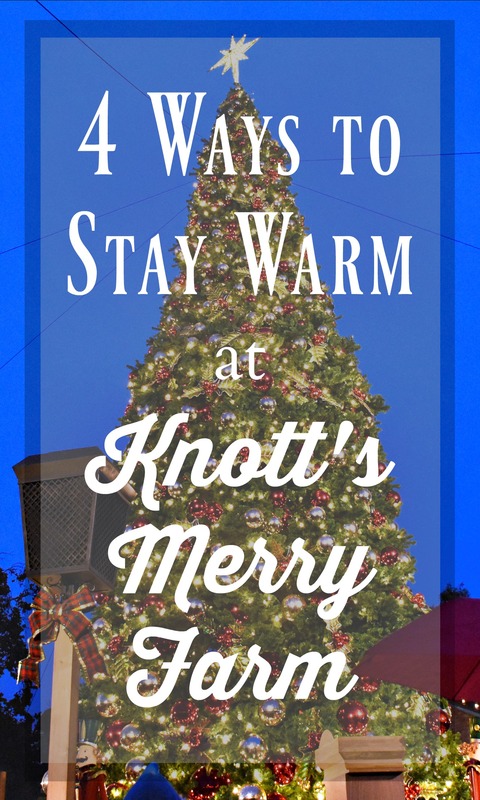 Because yes… even if it’s cold, if you have the chance you need to make it out to Knott’s Merry Farm. 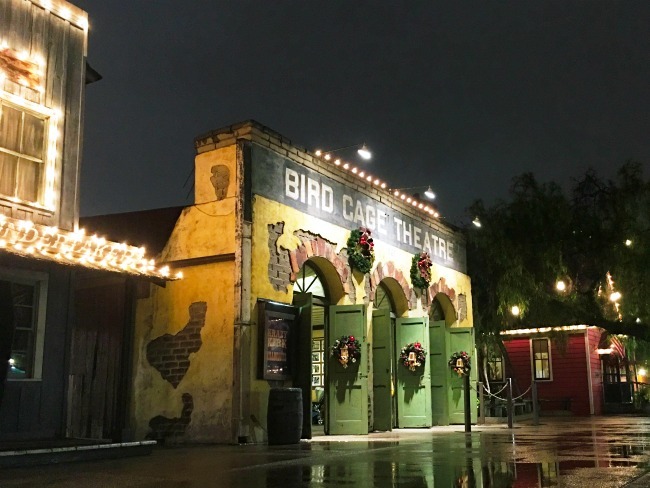 Two holiday classics, Charles Dickens’ A Christmas Carol and O. Henry’s A Gift of the Magi, are brought-to-life at the Birdcage Theatre. 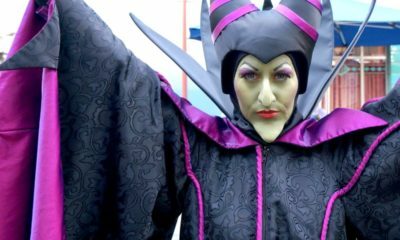 The shows always start on time, though you will have to wait outside until just a few minutes before the show begins. The good thing is that once you do get inside, the venue is nice and toasty. 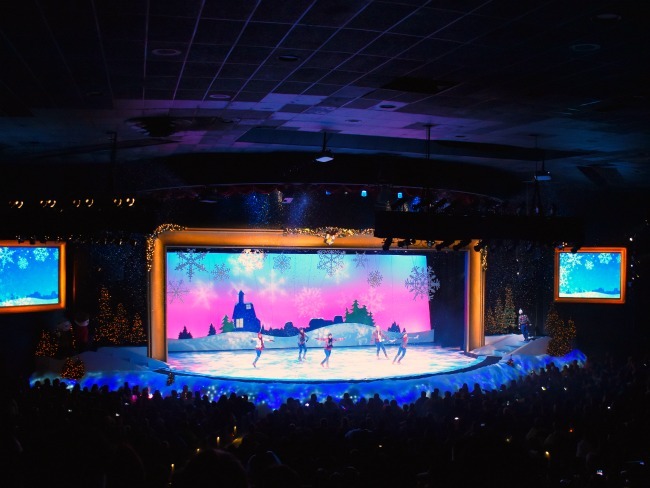 You can stay warm for about 15 to 20 minutes while the show runs and then leave the theatre with a warm fuzzy feeling in your heart too (thanks to the heartwarming story acted out on the stage). 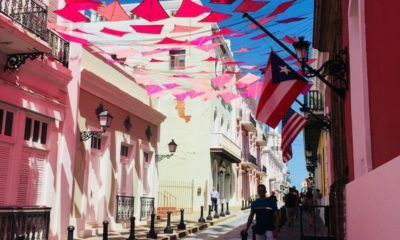 Click here for show times and performance dates. 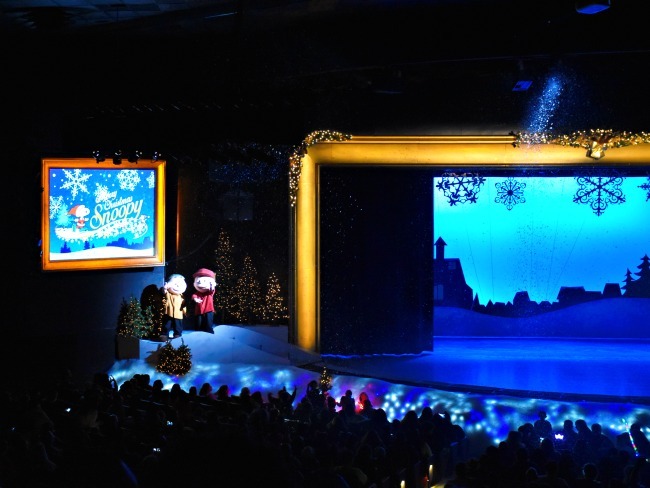 My favorite ice show, Merry Christmas, Snoopy, is back this year! 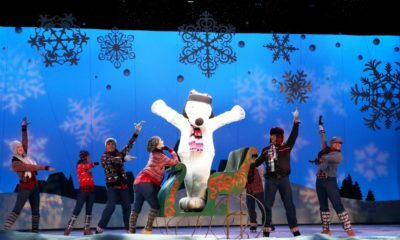 The show features Snoopy, the Peanuts and a cast of world class ice skaters along with Christmas classics and holiday favorites. 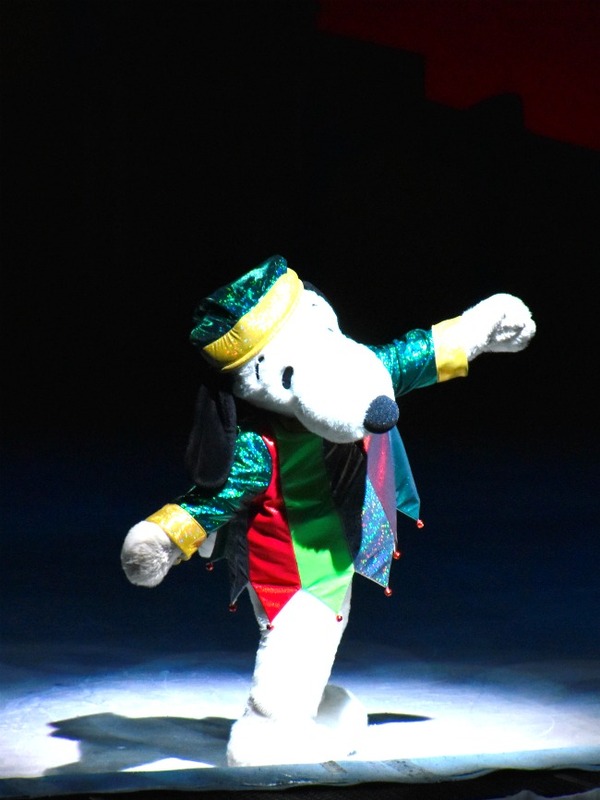 Snoopy makes constant appearances skating along with everyone else. And there’s really no bad seat in the Charles M. Schulz Theatre so don’t worry about lining up early for the show (although if you want bottom row seats you’ll have to do that). 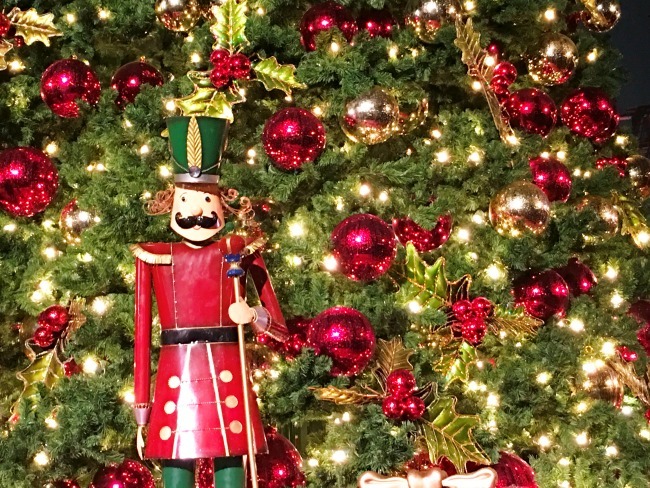 Also, vendors will come around selling light-up toys, so be prepared. 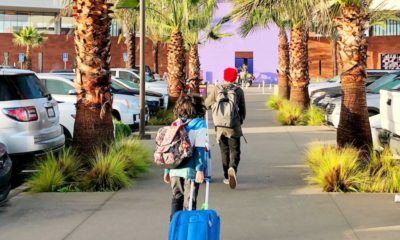 Tip: Pick up a Boysenberry Latte at the Starbucks outside of the theatre, and in front of Iron Reef. You can sip it while you watch the show. 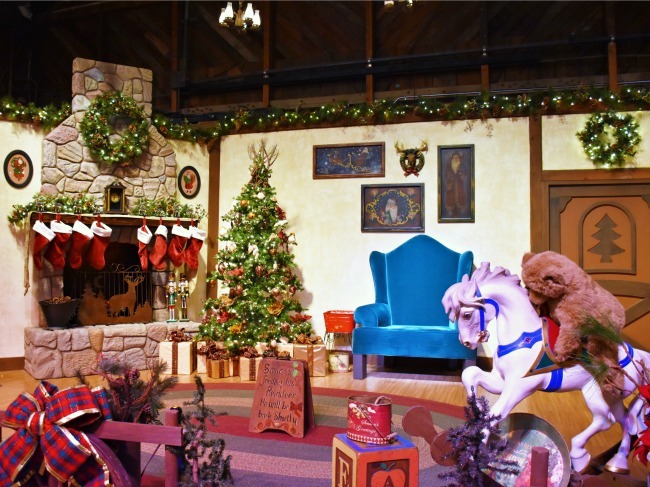 Perhaps my all-time favorite part of Knott’s Merry Farm is Santa’s Christmas Cabin. 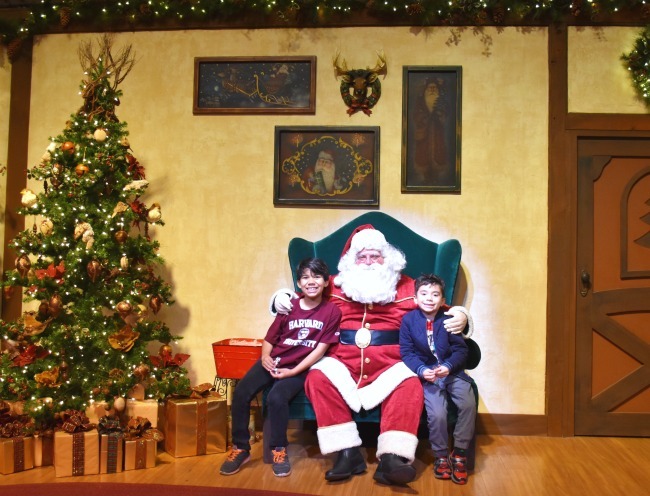 This is where you can stop by to see Santa, take pictures with him (using YOUR camera too! ), enjoy some holiday treats such as gourmet hot chocolate with marshmallows, freshly poured-to-order maple lollipops, and my favorite – hot spiced holiday wine! 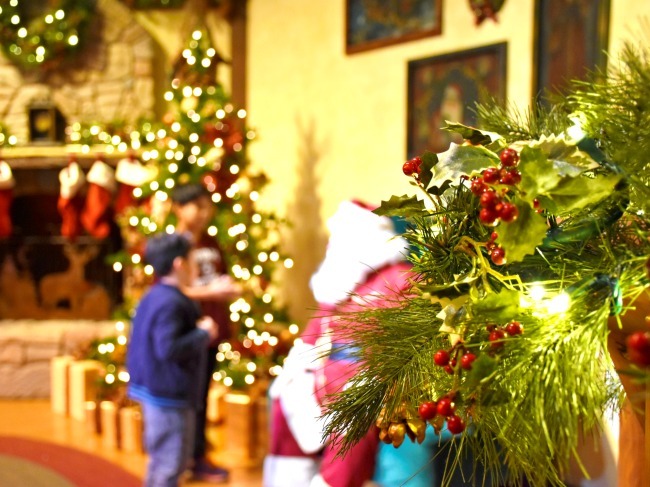 There are tables set up inside for you and your family and friends to sit down and enjoy your goodies and the festive atmosphere inside the warm cabin. 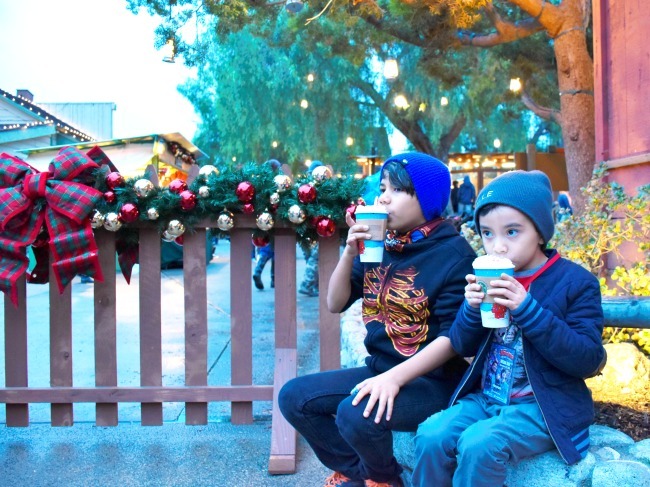 The hot chocolate drink is the kids’ favorite because they get to customize it to their liking. Of course, they also pile on the whipped cream so you really can’t go wrong in there. 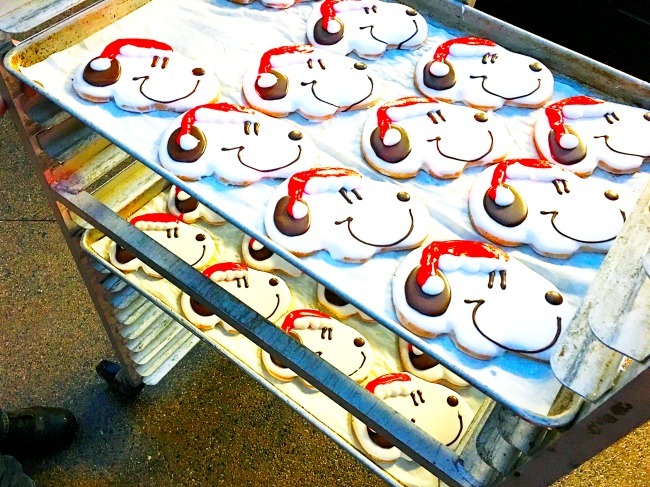 Pair it with a Snoopy cookie and you can spend a nice amount of time in there getting cozy by the faux fireplace. Getting these holiday treats is also a great way to kill time while you wait for Santa. Each kid that waits in line gets a candy cane from the big man himself as well as some quality time with him. 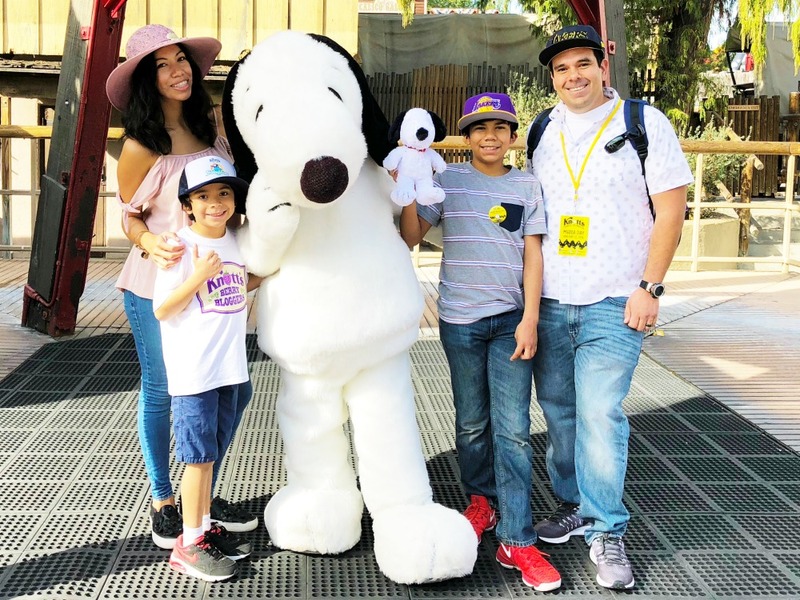 The Knott’s Berry Farm photographer also takes your picture, but gives you the chance to take your own with your own camera(s). 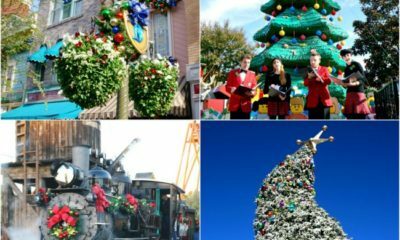 As you walk out, you’ll have the option to purchase a souvenir photo with Knott’s Merry Farm’s logo and date imprinted on it. 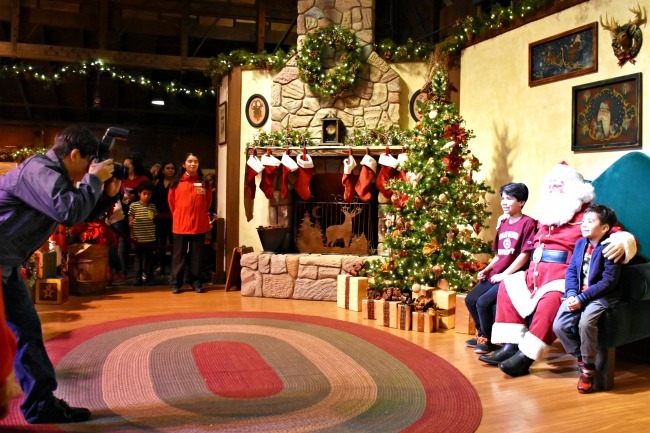 Don’t leave Santa’s Christmas Cabin without a family picture in front of their enormous tree! 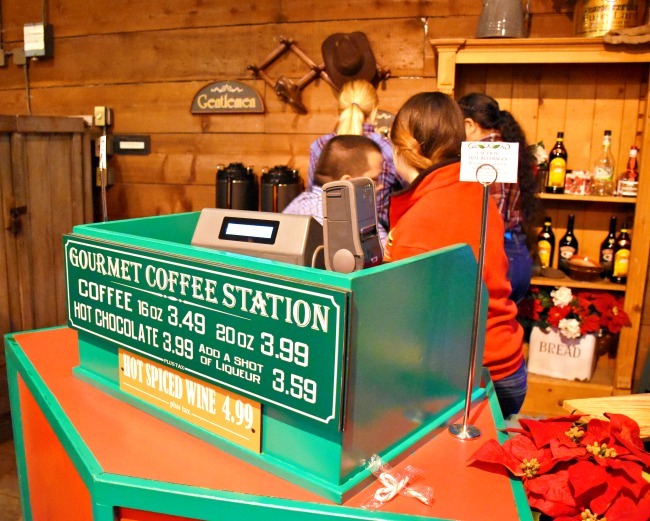 And if you’re walking around Ghost Town and find yourself getting chilly, come back to the patio at Santa’s Christmas Cabin – they have heaters out there! 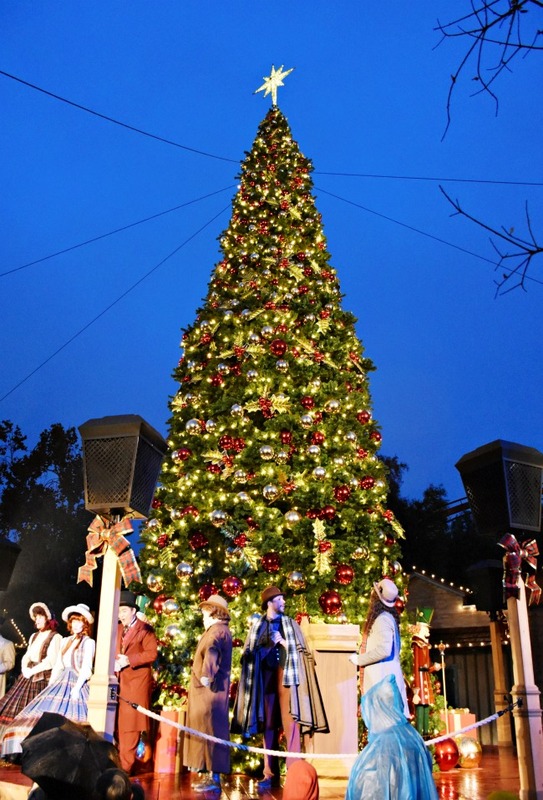 The Christmas tree lighting ceremony is under five minutes long, but you won’t want to miss it. Wait for it to start inside the Calico Saloon. 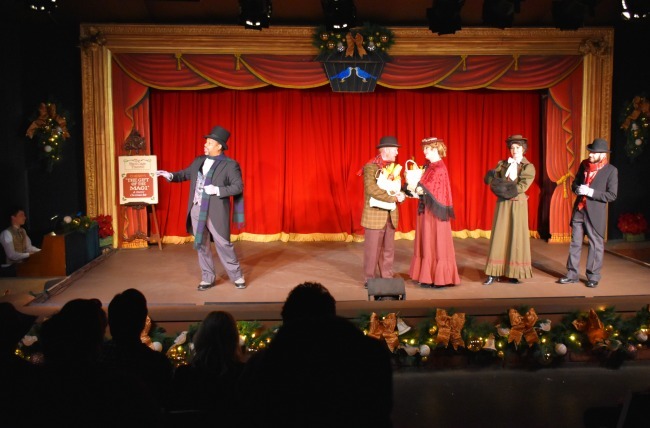 The last Calico Saloon Christmas Show starts at 4:30 p.m. and the tree lighting ceremony starts at 5:15 p.m. 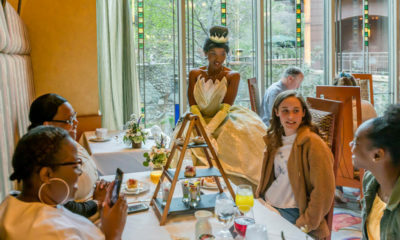 The tree is literally right outside the Calico Saloon so you can rush out there when the ceremony begins. 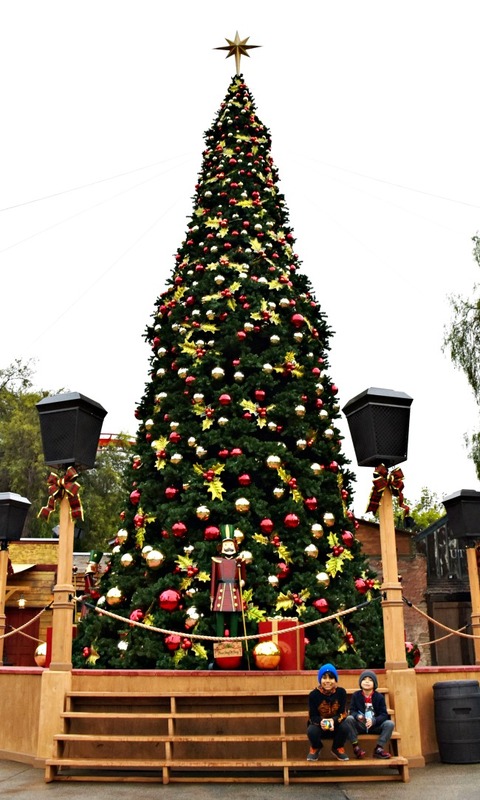 11:00 a.m., 12:30, 2:00, 3:30 & 4:30 p.m.
Knott’s Merry Farm is a lot of fun… even in the cold. 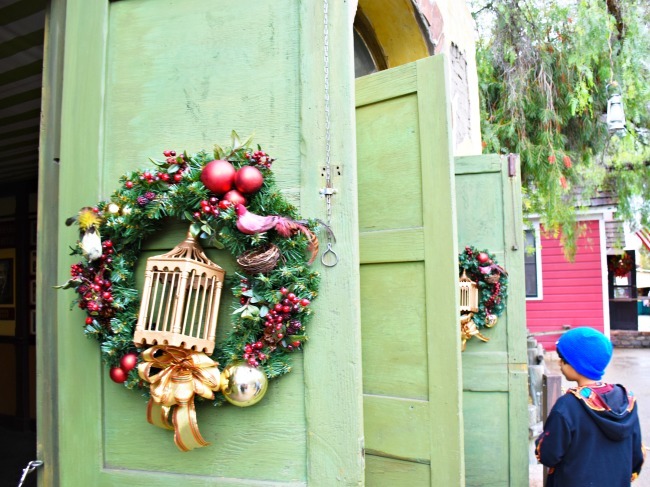 Ghost Town comes alive with strolling carolers, gorgeous decorations and their annual Christmas Crafts Village where you can support local businesses and do your gift shopping all in one place! 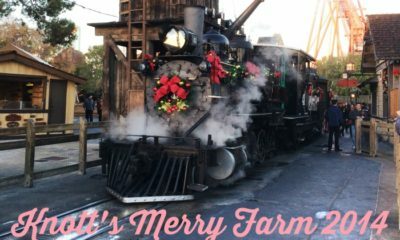 We always seem to take a million pictures whenever we visit (check out our Knott’s Merry Farm Facebook photo album), and I love seeing your pictures too, so make sure to share them on our Facebook page! Oh, and here’s a bonus tip, wait for the nightly snow fall (a.k.a. Snow and Glow) at Ghost Town inside the old school house. Stay nice and toasty! 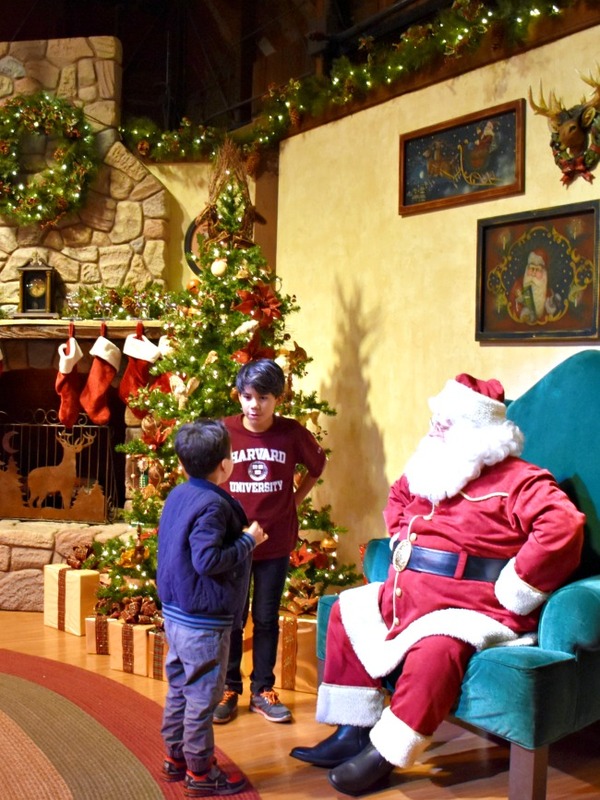 Visit https://www.knotts.com/merryfarm for more information about Knott’s Merry Farm 2016.